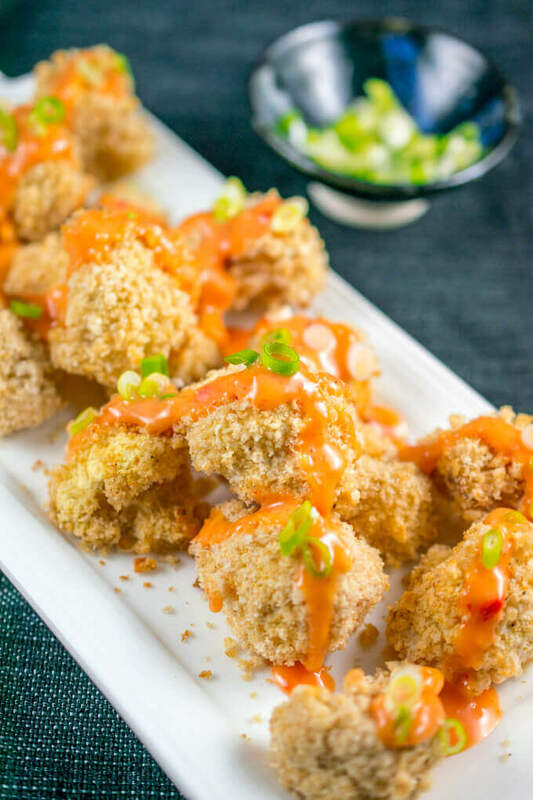 Crispy breaded and baked cauliflower is served with a spicy and creamy sauce to make this vegan bang bang cauliflower (which happens to also be gluten-free)! The ‘bang bang’ descriptor here refers to a dish at Bonefish Grill. Although I’ve never eaten at one, I did have a high school crush on a cool senior who worked there, so I would consider myself eminently qualified to recreate it ;). 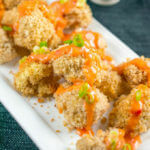 Originally made with shrimp, not cauliflower, the dish is made by deep-frying its battered main component to a crisp and serving it with a sweet and spicy mayonnaise-based sauce. My homemade oil-free vegan mayonnaise comes to the rescue here. Or your favorite store-bought vegan brand. They’re getting easier and easier to find. Even Hellman’s makes one now! Rice crisp cereal! Yep, I crushed up some rice crisp cereal with a rolling pin aka a bottle of wine, and used that as the crispy cauliflower coating. No egg substitute like aquafaba needed – just dip the cauliflower florets first in a mixture of brown rice flour (or another gluten-free flour) and water, then into the rice crumbs, and then bake them to perfection! One Degree Organics has a brown rice version, linked in the recipe ingredients list. 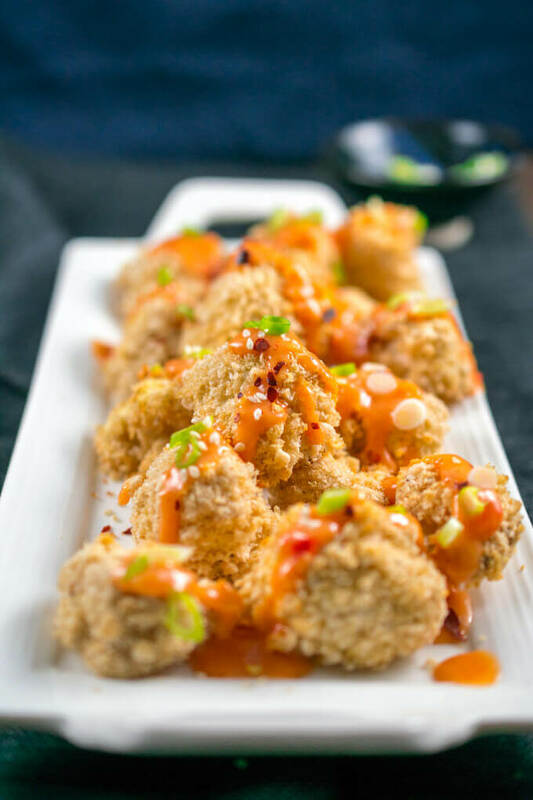 Crispy baked cauliflower pieces with sweet and spicy sauce make this bang bang cauliflower a winner. Vegan and gluten-free thanks to rice crisp cereal! Preheat the oven to 400 degrees Fahrenheit. Line two baking sheets with parchment paper. (Optional) lightly spray them with oil spray. Crush the rice crisp cereal into crumbs (but not completely to dust!) by either pulsing it in your food processor, or putting in a plastic bag and crushing it with a rolling pin or the side or bottom of a bottle. Add the crushed cereal to a small bowl and mix with the garlic powder, black pepper, and salt. Add the rice flour to a second small bowl. Slowly add the water a couple of tablespoons at a time, while stirring it together with the rice flour, until smooth. It should be thinner than pancake batter, but not totally liquid. Stir in the oil well if using. One by one, take a cauliflower floret, dip it into the rice flour mixture, shake off excess, and then dip it into the cereal crumb mixture to coat it. Place it on the baking sheet, leaving space between each piece. Continue until all of the cauliflower is used. (Optional) lightly spray the battered florets with oil spray. Bake for about 25 minutes, or until the coating is crisped and lightly browned. Make the sauce by whisking together all of the ingredients. Add more sweet chili sauce and/or sriracha to taste. 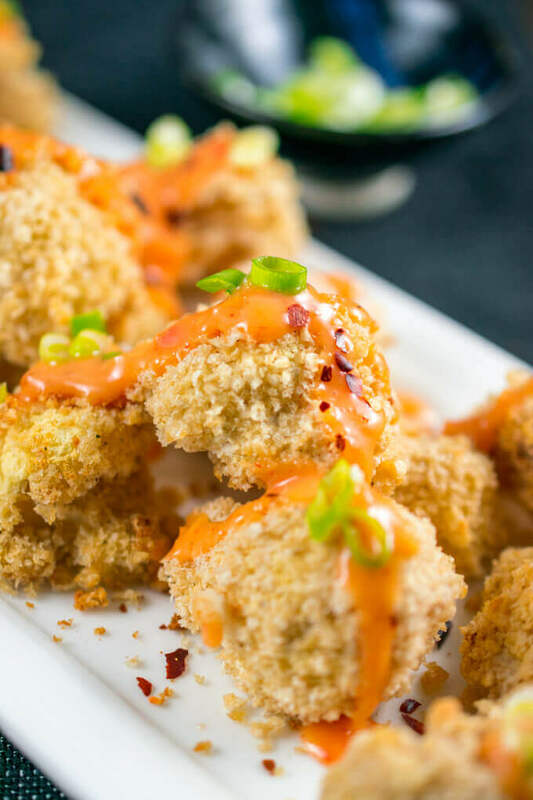 Serve the crispy baked cauliflower with the bang bang sauce. OIL-FREE: Skip the oil in the batter and don't use oil spray on the parchment paper or cauliflower. I have tested this version and it tastes almost exactly the same but does not brown very much and gets just slightly less crispy. Use my homemade oil-free mayo (linked in the ingredients list) or another oil-free alternative. RICE CRISP CEREAL: Feel free to use approximately 2.5 cups of panko breadcrumbs (gluten-free or regular) in place of the crushed rice crisp cereal. Crushed cornflakes are also a good substitute! RICE FLOUR: Instead of the rice flour you can also use white rice flour, all-purpose flour, brown rice flour, chickpea flour, etc. Just adjust the water as needed to get a thin batter that lightly coats the cauliflower when dipped. Nutrition facts will vary depending on the exact cereal, flour, and amount of dipping sauce consumed, as well as use of the optional oil. Adapted from (non-vegan) Kirbie’s Cravings. I made this, but I used tofu instead of cauliflower. It’s awesomely delicious! I love these type of plant-based cauliflower recipes. This one looks terrific, and I can’t wait to give it a try! omg! I have to make this! Bang bang anything is so good! This is something I have never heard of.. sounds interesting !! I will love to try it out Thankyou for sharing.